The International Baccalaureate (IB) Diploma Programme is a two-year curriculum for high-achieving high school students. It is one of four IB programs (two for younger students and one for students interested in career training). The IB Diploma Programme is the most widely offered IB program in the United States. 924 high schools are authorized to use and teach the IB diploma curriculum. In comparison, only 96 offer the IB Career-Related Programme. Students whose high schools participate in the Diploma Programme have the option to take the entire curriculum or select IB courses. After each course, students must pass an exam to receive credit. Colleges may award students credit for IB coursework. The International Baccalaureate Organization was founded in 1968, and it is headquartered in Geneva, Switzerland. The IB Diploma Programme for high school upperclassmen was the first program offered by the organization. It was followed by three others, including the Middle Years Programme for 11- to 16-year-olds and the Primary Years Programme for students ages 3 to 12. In 2012, the Career-Related Programme, the fourth and last IB program, debuted. This program, like the IB Diploma Programme, is for high school students. Because fewer than 100 high schools in the United States offer it, however, this article will focus only on the IB Diploma Programme. For more information about other IB programs, explore this website. Why should I consider the IB Programme? International Baccalaureate programs are offered and recognized worldwide. The idea is that students in a variety of different countries will learn the same curriculum during high school. When it comes time for students to apply for college, institutes of higher education will know exactly what an applicant’s high school curriculum entailed. They’ll also know that the student has met college entry requirements. Within the United States alone, over 1,600 colleges have policies that recognize the IB coursework that students completed in high school. For some institutions, qualifying grades on IB exams are enough to bestow college credit, while at other institutions, qualifying grades may not provide credit but may allow students to skip ahead past introductory-level classes. How do I join the IB Programme? Over 900 high schools in the United States offer the International Baccalaureate Diploma Programme. This is a two-year program for eligible juniors and seniors. Typically, high schools allow only students with a certain grade point average who have taken specific preparatory classes as freshmen and sophomores to take part in the program. You can search for high schools that offer the IB Diploma Programme here. Once you’ve verified that it’s offered at your high school, be sure to look into any specific requirements that your school may have by exploring its website or talking to a guidance counselor. What classes do I take if I join the IB Programme? The IB Diploma Programme requires students to take a variety of classes in six subject areas: Language and Literature, Language Acquisition, Individuals and Societies, Science, Math, and the Arts. Classes are offered at two levels: standard level (150 hours of instruction) and higher level (240 hours of instruction). 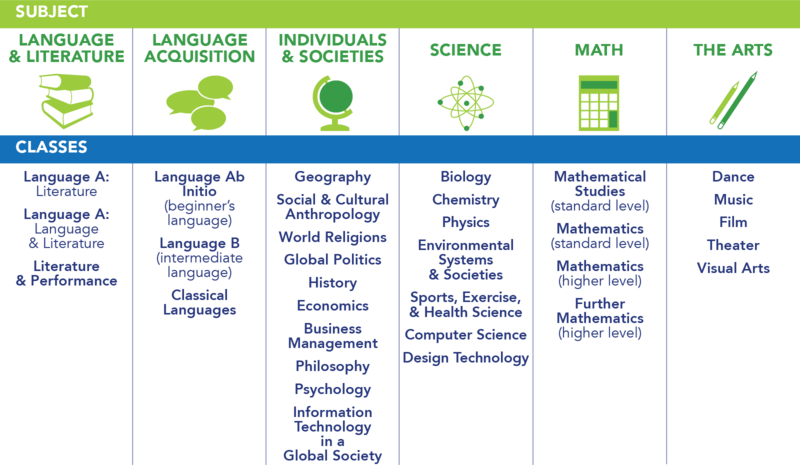 In a given year, students must take three or four higher-level classes, and the remainder must be standard level. The classes generally cover the same material, but higher-level classes may delve deeper into some of the covered topics or include topics that are beyond the scope of a standard-level class. For example, Language A: Literature at the standard level covers 10 literary works, while the higher level covers 13. The Theory of Knowledge (TOK) is a course that requires students to reflect on what it really means to learn, how we as a human race learn, and how we know what we know. It culminates in a verbal presentation and a 1,600-word essay. The Extended Essay is a 4,000-word essay on a self-directed research project. Students have the freedom to choose a topic that interests them, provided it is related to one of the six core subject areas. Creativity, Activity, Service (CAS) is required but not graded. Students perform a variety of projects involving creative thinking, physical activity, and/or volunteer service. The IB curriculum intends for students to develop both inside and outside of school. Can I take an IB class without enrolling in the IB Programme? Students who are interested in taking a number of IB courses but not interested in receiving an IB diploma may be allowed to do so if they meet the prerequisites for their selected classes. Following the completion of the classes, students can sit for the IB tests with their classmates to potentially earn college credit. To sit for an exam, a student must have taken the IB course. Talk to a guidance counselor at your high school for more information. What are IB exams like, and how are IB exams graded? At the end of the school year students are subject to an exam period, during which they are tested over everything they’ve learned in each of their IB classes. Exams are graded from 1 to 7, and exam grades for classes in the same subject area are averaged so that at the end of exams, students have a score ranging from 1-7 for each of the six subjects. These are added together to give an overall IB score. The TOK and the Extended Essay may add a combined 3 points to a student’s total score. The highest possible IB diploma score is 45, but students who earn at least 24 points, do not have any failing scores, complete the entire curriculum, and meet other eligibility requirements are granted an IB diploma. A score of 1 is a failing score; students with a 1 in any subject will not earn an IB diploma. Can I take an IB test if I took an IB class but I’m not enrolled in the IB Programme? Students who took only a couple of IB courses throughout their high school education will earn individual grades on each exam, like students aiming for diplomas. However, their scores will not be averaged to calculate subject scores and instead will stand on their own. Students can submit these scores to prospective institutions to determine if they will be awarded any college credit. Check with your institution to see if it accepts IB exam scores and rewards high scores with credit. Even if a school does not give credit for IB exams, the IB curriculum is internationally recognized, and taking IB classes and doing well on the associated exams enhances a student’s competitiveness on their college applications. Can I take IB exams if I didn’t take the associated IB class? Students who do not take IB classes are not allowed to sit for IB exams. If your school does not offer IB classes, it may offer AP classes or other rigorous coursework that can make you a more competitive college applicant. How much does it cost to take an IB exam? Unfortunately, these exams are not free. Students must pay between $168.00 and $172.00 to register for the exam period (depending on when in the year they are testing) and an additional $116.00–$119.00 per subject test. Students who are typically eligible for fee waivers should talk to their IB coordinators or guidance counselors to learn about the possibility of reduced or free testing.